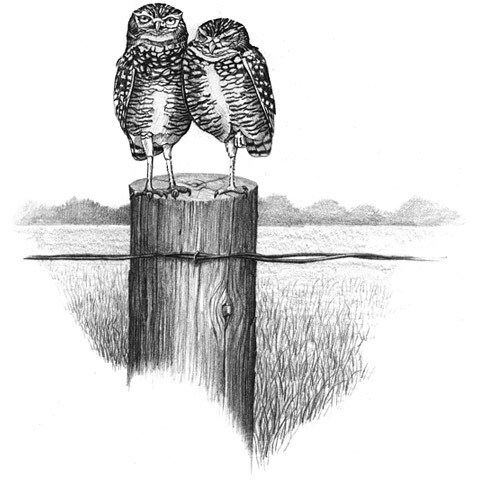 Not much bigger than a robin, the burrowing owl stands on long, slim legs on the ground or atop a fence post. It scans the treeless landscape for rodents, insects, or small birds, ready to take to the air in pursuit. In an underground nest (the abandoned burrow of a woodchuck, badger, or other small mammal), the owl and its mate take turns brooding six to 10 eggs. If a predator threatens their burrow, they issue a distress call that perfectly mimics a rattlesnake's warning. Once common on the Prairie grasslands, the burrowing owl is now listed as endangered by the Committee on the Status of Endangered Wildlife in Canada. Today, in spite of recovery efforts, this little owl has grown even scarcer. The reasons for its decline include habitat loss and fragmentation, lack of suitable prey, poison sprays, and other hardships on its breeding grounds in Canada and on its wintering range in Central and South America. One thing's for sure: the burrowing owl needs all the help it can get. Provincial biologists and landowners are cooperating to help out this short-tailed bird in Manitoba, Saskatchewan, Alberta, and British Columbia, but in spite of determined recovery efforts, fewer and fewer owls are nesting on the grasslands. In many cases the public can't take part in complex and delicate recovery plans, but it is not so for the burrowing owl. You may be able to build an artificial nest "burrow", organize a publicity campaign, help with a feeding program, or improve habitat for this unique bird. For suggestions on how to help the burrowing owl in the Prairie provinces and British Columbia, contact your provincial wildlife agency.